The new one came, and it was clear they'd had the base rebuilt. Thank goodness, because passive-aggressive me didn't want to have to reject it a second time. Sometimes, it really is all about home decorating. 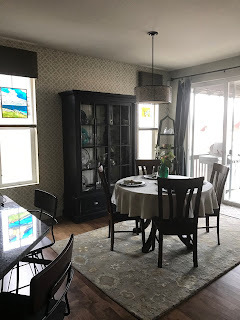 I haven't had a china cabinet, or any sort of kitchen/dining display piece, since I sold my old one in Madison, to make room for THAT kitchen remodel. Of course, we moved to Colorado and I realized the piece I sold would have been perfect here. Sigh. Anywhoo, I've been shopping for the last year for something that would work in our space. Compact, nice looking, and functional. Finally, we found what we wanted after a trip to Ethan Allen (after visiting at least ten other stores). I can now display some of the pieces I've bought as well as some of mom's china. The delivery was scheduled for yesterday, earlier than promised, and I was excited.